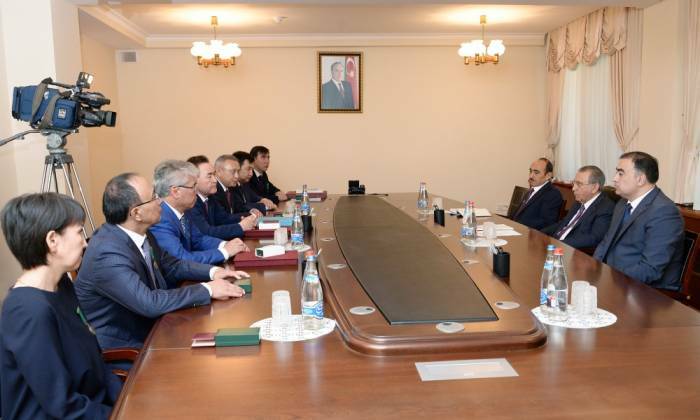 The Head of the Presidential Administration of the Republic of Azerbaijan, academic, Ramiz Mehdiyev met with the delegation led by the Head of the Chancellery of the Republic of Kazakhstan Mahmud Kasimbekov. Ramiz Mehdiyev noted that the members of the Kazakh delegation were awarded the “Taraqqi” medal for their contribution to the strengthening of relations between the two countries by the order of President Ilham Aliyev and presented them the medals. "There were close friendship relations between the national leader Heydar Aliyev and Nursultan Nazarbayev, the national leader always highly praised the activities of Kazakh President Nursultan Nazarbayev and President Nursultan Nazarbayev had great respect for national leader Heydar Aliyev. Azerbaijan and Kazakhstan had stepped on the path of rapid development by overcoming difficulties thanks to a wise policy of Heydar Aliyev and Nursultan Nazarbayev following the collapse of the former Soviet Union. Ilham Aliyev and Nursultan Nazarbayev continued the traditions of friendship and cooperation between our peoples and states. Over the past period, more than 100 documents have been signed between our countries, and mutual investment has been made. Our countries support each other in international organizations, and cooperation between the parliaments is at a high level", Ramiz Mehdiyev added.